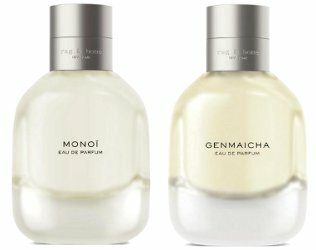 American fashion brand Rag & Bone has launched two new unisex fragrances, Monoï and Genmaicha. Monoï ~ "Frangipani flowers and Gardenia petals, with a musky and creamy aspect." With frangipani, pear, banana leaves, gardenia, tuberose, orange blossom, sandalwood, vanilla and solar musks. Genmaicha ~ "Green Tea, Matcha infused with Rice, with floral and nutty aspect." The notes include bergamot, mandarin, yuzu, green tea, jasmine, nutmeg, rice, matcha and cedar. Rag & Bone Monoï and Genmaicha are available in 50 ml Eau de Parfum, $150 each. These two actually sounds like nice summer scents. They do! Seems relatively unlikely I’d pay that much for either of them, but maybe they’re genius. I’m interested in giving them a sniff, at least. I have a storefront near my work so will have to see if they’re in stock! These sound nice, especially genmaicha, but they seem far too expensive for a jeans store perfume.